Bellevue has become a majority-minority city, according to data released last month by the U.S. Census Bureau. Bellevue’s diversification is part of a broader trend in King County, particularly in the South End. Maybe there are still some folks who think of Bellevue as the homogeneous, mainly white suburb that it once was. Well, here’s some news that should put that outdated image to rest once and for all. Bellevue has become a majority-minority city, according to data released last month by the U.S. Census Bureau. The non-Hispanic white population dipped below the 50 percent mark — though just barely — in 2015. Indeed, just five years earlier, the 2010 Census showed whites as a solid majority — 59 percent of the city’s population. Bellevue’s diversification is part of a broader trend in King County, particularly in the South End. Tukwila, SeaTac, Bryn Mawr-Skyway and Boulevard Park are among the most racially diverse places in the U.S. Renton, Federal Way and Kent are also majority-minority cities now. But Bellevue stands out among these places because of its affluence. The city’s median household income hit $99,000 last year — even higher than Seattle’s. In contrast with Bellevue and much of South King County, Seattle is just as white as it was in 2010, at 66 percent of the population. Seattle remains fifth whitest among the nation’s major cities. The Census Bureau produced 2015 estimates on race and ethnicity for 318 U.S. cities. Of those, 144 — including Bellevue — were less than half white. Bellevue is also Washington’s largest majority-minority city, with a population of 139,000. In Bellevue, two factors have brought about rapid diversification since 2010. On one hand, the population of people of color surged by about 20,000 in this period. Most of that increase came from the Asian population, which grew by 14,000. Latinos also increased in number by more than 3,500, and multiracial people by about 2,000. But those increases are just one part of the equation. 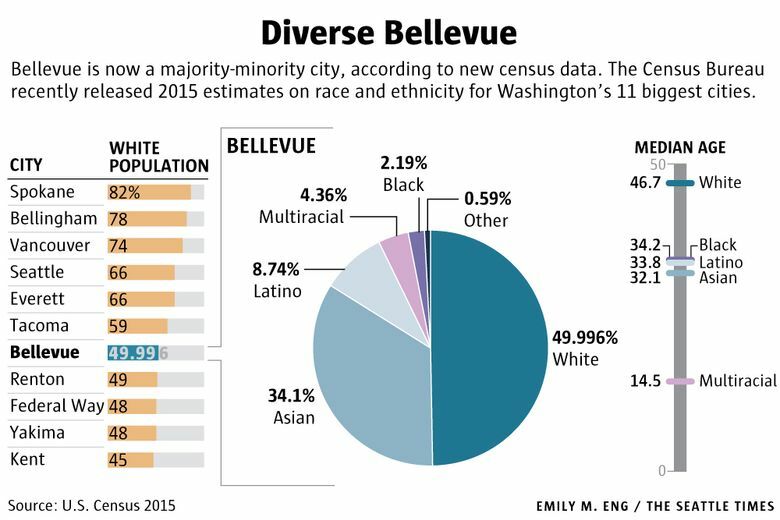 At the same time, the number of whites in Bellevue didn’t grow at all — in fact, it shrank. The city’s white population has been declining incrementally since 2006, when it peaked at 81,500. Last year, the number fell below 70,000. There’s no mystery behind this decline. 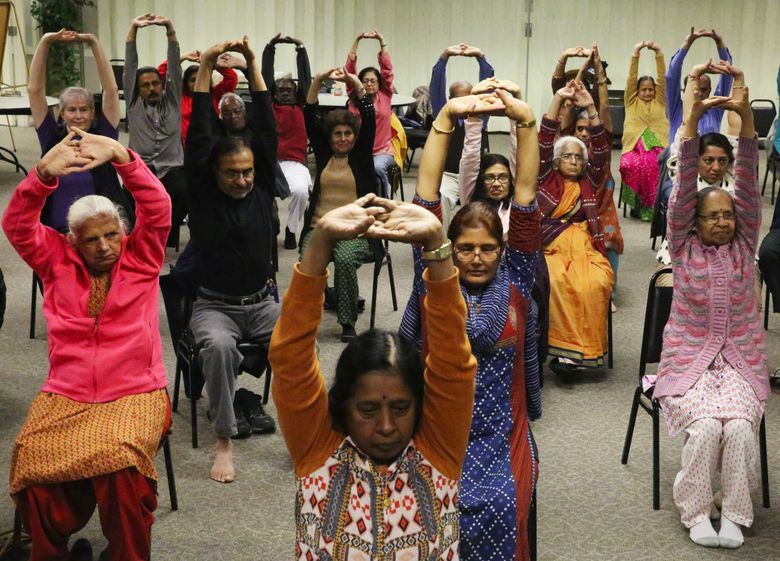 Whites are a rapidly aging demographic in Bellevue, as in much of the nation. The white median age in Bellevue is more than a decade older than that of other racial and ethnic groups. And the one age bracket that remains overwhelmingly white is 65 and older — three out of four Bellevue seniors are white. Manuel notes that some older, longtime Bellevue residents have embraced the city’s new diversity, while for others, adjusting to the pace of change has proved difficult. The city has a mediation department to help work through some of these issues. Manuel says the benefits of diversity, though, far outweigh any such challenges. Bellevue has become a much more dynamic place, both culturally and economically. 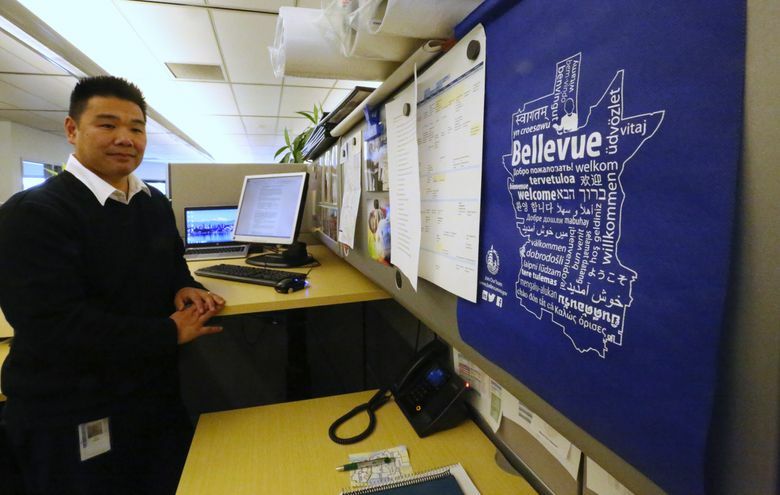 The city administration recognizes diversity as one of Bellevue’s strengths — and a point of civic pride — and it has taken strides to instill cultural competency internally through workshops and training.